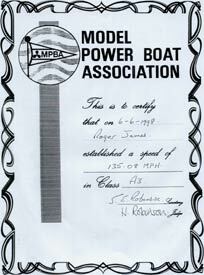 Roger James competed at the very highest level with his A2 and A3 hydroplanes. Not only were his hulls superb examples of model boatbuilding, the engines were reworked to produce immensely powerful and reliable motors. As well as breaking the British record in A3, Roger still holds the A2 class record at 129.3mph. 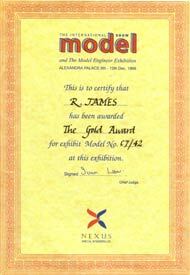 Following his successes in European and World Championship meetings, Roger entered his Gold medal winning A3 boat into the Model Engineer Exhibition at Alexandra Palace, where the quality of his workmanship was recognised with another Gold medal and the Willis Cup. 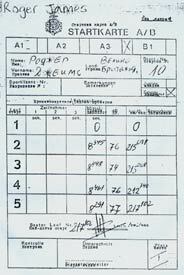 To support his entry, Roger produced a very detailed document describing the building and development of this highly successful boat. OTW is delighted that Roger has allowed us to publish the document so that we may all benefit from his skill, expertise and vast experience of competitive tethered hydroplane racing. 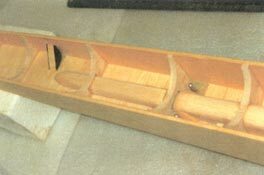 This model is the fifth one built in a development series of tethered boats. The basic design follows criteria that have evolved over many years of experiment by experts in the field, from all over the world. The builder has incorporated several features that have been developed from his own experience in the design and running of this type of boat. Particular credit must be given to Vadim Subbotin of Vladivostok, whose original drawing has formed the basis for some aspects of this particular boat. This model has achieved many successes in competition both nationally and internationally, culminating in the gaining of the A3 Class gold medal at the 1999 NAVIGA World Championships, held at a purpose built venue in Bulgaria at the town of Pazardjik. The winning speed being 217kph (134.9mph) timed over 5 laps of 100 metres per lap. 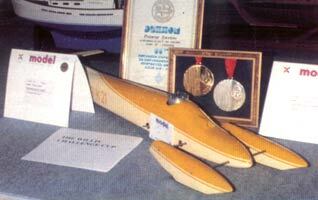 During the 1998 season at an International meeting in Amiens (France) the model set a new British record for 10cc hydroplanes with a speed of 135.08mph. This record equated to a 3 stopwatch average time of 8.28 seconds for the half kilometre course. 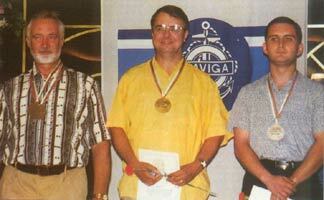 In 1997 the model took the silver medal position in the NAVIGA World Championships, again in Bulgaria, with a speed of 215.3kph (133.79mph). The model can be split into several distinct areas, each creating its own problems from a design and construction point of view. Photographs and some drawings have been included that may help to illustrate some of the techniques used or developed by the builder. 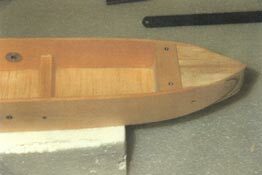 Basic construction of the hull is a combination of Lime wood sides with the bottom made of a formed laminate of balsa/epoxy resin/balsa giving a very strong yet very light structure. 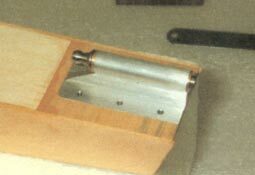 The hull sides are kept in their correct relationship whilst bonding by using a spine of aluminium formers on a long ground shaft. Accuracy of construction is rewarded by a hull that can accurately duplicated later if desired. 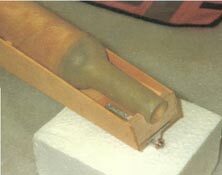 The tube that creates the backbone of the model is an epoxy and glass-cloth moulding made on a contoured mandrel, creating a very strong but light and fuel proof housing for the exhaust and muffler system. Where appropriate, epoxy board is used in highly loaded areas such as rear tether point and blades underneath the sponsons. 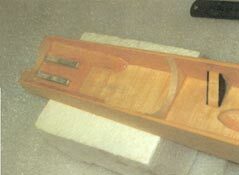 Block balsa of the required density is used for sponson and engine cowling. Where necessary, hank bushes are made of stainless steel, as are all the screws used on this model. The model is finished by covering with lightweight glass cloth fixed with laminating epoxy resin and after final sanding is painted with two-pack epoxy paint. This gives a durable, but not glass hard finish that is both fuel and waterproof. 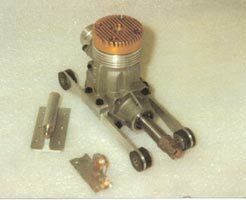 The engine is a two-stroke glow plug motor designed for a very high performance using 80% methanol and 20% castor oil fuel. Extensive work has been carried out on the basic commercial motor (OPS) with little of the original motor remaining either in use or un-modified. The piston and liner unit comprises of a chromed brass liner and aluminium piston. The liner for this particular engine was made in Moscow and the piston made by the builder from high silicon aluminium alloy. The separate combustion chamber cylinder head is homemade from brass not aluminium as is more usual. Eight bolts have been incorporated in the cylinder head clamp ring to eliminate possible distortion from the original four-bolt system. Connecting rods are usually made from aluminium in this type of engine, however this motor features a solid steel hardened and tempered rod running with crowded rollers on the big end. The crankshaft is lightened and balanced whilst the induction disc is also slightly modified. Special exhaust adaptors have been designed and manufactured to allow the engine and exhaust system centre lines to fit exactly with the design concept. 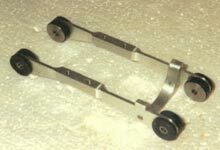 The motor mounting cradle has been developed to eliminate vibration from the hull. This benefit is two-fold. Firstly, any vibration is sucking power from the motor, and secondly vibration causes noise. The model has to conform to strict noise regulations; therefore any slight reduction is beneficial. The rubber mounting bushes have been redesigned several times during the development of the system, the current one appears to give an acceptable compromise of rigidity, noise reduction, surface area and durability. The exhaust system features a tuned pipe and an after muffler for silencing purposes. The tuned pipe is a modified commercial unit that has been altered to provide a more ‘flexible’ system with regards to power bands and maximum engine revs. The muffler features a system of swirl plates and blind stingers, using cross-holes to allow adequate gas flow. No absorptive packing is used in the muffler, the reason being that the muffler weighs the same for each run if the unit does not absorb any moisture. 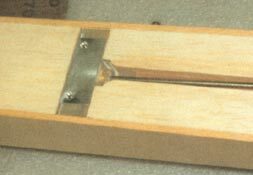 Holding the model vertical for a period between runs is all that is required to remove any water. It is also a maintenance free system. Various pipe shapes and lengths have been tried over the years, but the present one gives the most consistent results to date. The fuel tank is made from shim brass plate with thin walled copper pipes, silver soldered together to form a strong, potentially leak free, unit working on the well-known uniflow principle. This gives a more consistent fuel feed for the duration of the run, preventing the tendency for the boat to run initially rich then lean, this often being associated with other tank designs. This boat features a very small tank, benefits being that it allows more setting movement inside the boat and it also prevents the engine for running for overlong periods, cutting down wear and tear and preventing the boat from running on its own created backwash. The propeller shaft is made from the best quality piano wire with an intermediate Oilite bearing held in a housing using a purpose designed rubber bush to prevent noise and vibration. The skeg unit is a combination of an aluminium body machined from solid, gunmetal bushes and hardened, tempered and ground shaft. The shaft is screw cut on two diameters using ME 40 TPI thread form, giving a strong, fine pitch thread that is perfectly durable in use. The shafts are made from EN 14 (1.5% manganese steel), machined in the annealed condition and then hardened, tempered and ground. The ball and socket joints are also made from this material, the joints being sweated onto the piano wire drive shaft with soft solder. 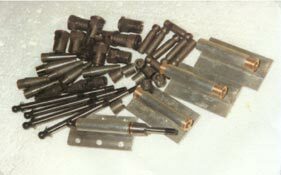 Drive pins, which are loose, are made from either piano wire or bearing rollers and held captive by shrouds. 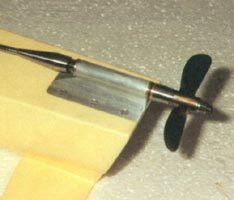 Apart from the engine, the single most important item on a tethered hydroplane is the propeller. The builder manufactures his propellers by using blanks of 1.5% Nickel Chrome Molybdenum alloy steel, bought in at a tensile strength of 55 tons per square inch. The pitch is machined onto the blank by utilising a special fixture, mounted onto a dividing head on the builders home-made vertical milling machine. 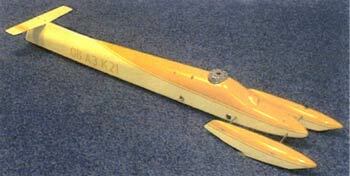 This gives a very accurate basic pitch to the prop, essential if an identical propeller is required. After milling the basic pitch, the embryo propeller is turned, using co-ordinate profiling and then finally filed to outer shape, ensuring symmetry at all stages. The cupping required on the blades is then produced by hand work, using rotary burrs, riffler files, Swiss files and lots and lots of patience. Propellers can take up to 30 hours to make by this method, but if made in batches this time reduces to about half that figure. 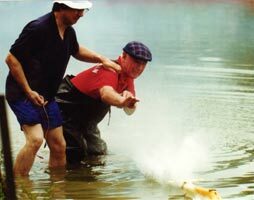 It may appear long-winded, but is the only way to extract the maximum out of the boat. Any slight imperfection on the propeller can result in a blade breaking from the hub. 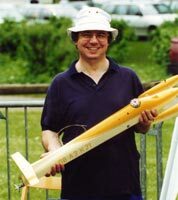 Tethered hydroplane racing is one of the earliest forms of model boat competition, but has kept pace with modern technology as the performance reflects. It is not a ‘black art’! Present day racers are always willing to offer advice to anyone interested in joining the absorbing branch of the hobby. 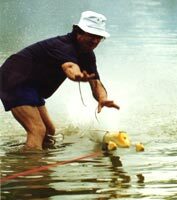 Contact can be made through clubs, direct approach at regattas or exhibitions or via this website.